Mol. Cells. Jan 31, 2019; 42(1): 45-55. The perfusion system was designed as a closed circuit with a roller pump to provide a constant flow rate (for overview see Fig. 2). First, the portal vein was cannulated, which was the most critical step of the method. It was important to pre-warm the water bath and/or the connecting lines to 37°C before the perfusion. Although puncturing the portal vein of mice may be technically difficult, in situ liver perfusion should be circulated through the portal vein to mimic physiologic antegrade circulation. After the portal vein was successfully cannulated (Fig. 2A), the perfusion setup, including the connecting lines and the roller pump, was stabilized by fixation to avoid dislocation of the catheter during circulation. The pump was started to circulate phosphate buffered saline (PBS) solution, resulting in conspicuous distension of the inferior vena cava (IVC) and making the latter easy to cut. After confirming successful cannulation by observing the swelling and discoloration of the liver, the chest was opened to expose the right atrium of the heart (Fig. 2B). The suprahepatic IVC was cannulated through the puncture of the right atrium, with clamping of the infrahepatic IVC causing the solution to exit through the suprahepatic IVC catheter. The system was perfused for 5 min with PBS to flush out blood and prevent clotting of the hepatic vessels (Fig. 2C). The inlet of the line connected to the portal vein was inserted into experimental medium, based on either DMEM (Welgene) or RPMI-1640 (Welgene) supplemented with 10% fetal bovine serum (FBS; Welgene) and 1% penicillin-streptomycin (Gibco). The inlet of the other line connected to the pump was connected to the suprahepatic IVC catheter to close the circuit (Fig. 2D). The lines connected to the portal vein and the suprahepatic IVC should be identical; otherwise, the flow rate of both lines would be different, which may cause the perfused liver to swell or shrink. Alternatively, a 1 ml syringe body can be connected to a suprahepatic IVC catheter to create a flow reservoir. After establishing the closed circuit, circulation can be maintained for up to 2 h with media containing various experimental conditions. The choice of circulating medium and its constituents depended on the aim of the experiment. A minimum of 25 ml of medium was required to establish the closed circuit based on our system with the roller pump (Watson-Marlow) and the connecting lines (cat. no. 14-190-516, Fisher scientific). However, the optimal volume of perfusion medium should be individualized based on each laboratory’s own perfusion system. Circulation for more than 2 h is not recommended, because cell viability and function decrease noticeably after 2 h probably due to increased hypoxic stress ( Supplementary Fig. S1). The hepatocellular function and viability remained nearly stable during the perfusion period up to 2 h; however, the function and viability were remarkably decreased after 2 h of in situ liver perfusion as assessed by the gene expressions of albumin and CYP2E1 and TUNEL staining, respectively ( Supplementary Fig. S1). 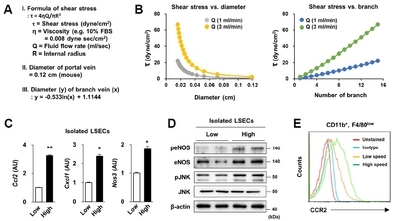 Increased hypoxic stress is presumed to be responsible for tissue damage and increased apoptosis, indicated by elevated LDH in circulated medium and HIF-1α and cleaved caspase 3 expressions in the liver after 2 h of in situ liver perfusion (Lee et al., 2018)( Supplementary Fig. S1). One of the critical drawbacks of the in situ liver perfusion method is the insufficient oxygenation of the liver parenchyma. This may be circumvented by increasing the infusate flow rate, enhancing oxygen supply to the parenchyma. However, increased flow rate may induce shear-stress-induced injury to LSECs. Alternatively, an oxygenator can be applied to increase dissolved oxygen concentration in the circulating media; or oxygen carriers such as perfluorcarbons or erythrocytes can be added to the circulating media to aid oxygen transfer to the liver parenchyma during perfusion (Bessems et al., 2006). 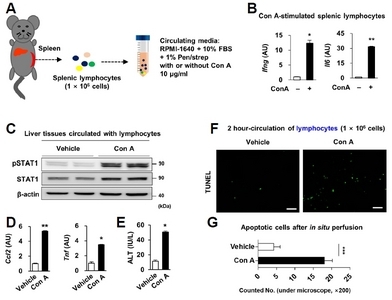 Another drawback is the maximum circulation time, which is only 2 h. At longer times, cell viability and function dramatically deteriorate ( Supplementary Fig. S1). This limitation must be considered when analyzing long-term rather than immediate-early responses of the liver. 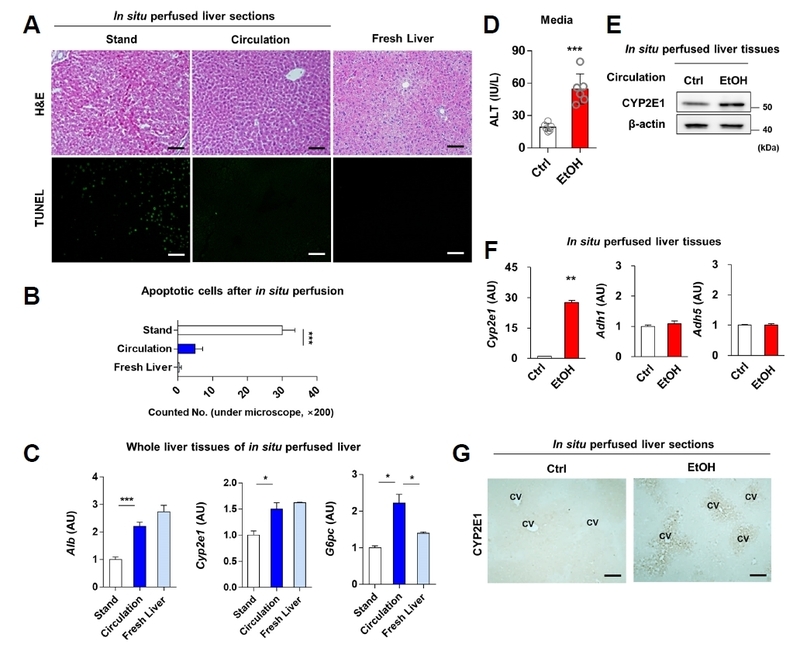 Considering this point, it may be more useful to apply in situ liver perfusion method to see the liver-specific response secondarily after disease development in mice such as CCl4-induced liver fibrosis or high fat diet-induced nonalcoholic fatty liver disease. Further research is required to increase the total circulating time. Although one of the advantages of the in situ liver perfusion method is the ability to evaluate liver-specific responses, by excluding the effect of other organs, in other words, various interorgan interactions that occur in vivo cannot be assessed. Mol. Cells.Jan 31, 2019; 42(1): 45-55. Received August 2, 2018; Accepted October 18, 2018. (A) The anesthetized mouse is cannulated via the portal vein and the line is connected. (B) The pump is started, the infrahepatic inferior vena cava (IVC) is cut off, and the chest of the mouse is opened. (C) The supraheptic IVC is cannulated via the right atrium and the infrahepatic IVC is clamped. The liver is perfused with PBS to eliminate blood. (D) The line is connected to the suprahepatic IVC catheter, followed by closed circulation for up to 2 h. The resulting liver samples can be ground to isolate hepatic immune cells, or further digested with collagenase to isolate each hepatic cell type (e.g. hepatocytes, hepatic stellate cells (HSCs), Kupffer cells (KCs), and liver sinusoidal endothelial cells (LSECs)). (E) Perfusion of the liver with collagenase solution, followed by in vitro digestion and filtering of the cell suspension through a 70-μM mesh. (F) Pelleting of hepatocytes by low-speed centrifugation (50×g for 5 min at RT, twice). Hepatocytes can be further purified by 40% Percoll-gradient centrifugation (1,000×g for 10 min at 40°C). Supernatants containing non-parenchymal cells are pelleted by high-speed centrifugation (590×g for 10 min at 4°C, twice) and further separated by density gradient centrifugation (1,600×g for 17 min at 4°C). HSCs can be further purified by retinoid-based FACS sorting. KCs and LSECs can be further purified using F4/80+ and CD146+ MicroBeads, respectively, followed by MACS. (A–C) Mice were sacrificed and perfused in situ with DMEM containing 10% FBS and 1% penicillin-streptomycin or not perfused. (A) Representative H&E and TUNEL staining. Scale bars = 50 μm. (B) Numbers of apoptotic cells assessed by TUNEL staining. (C) Levels of hepatic Alb, Cyp2e1, and G6pc mRNAs. (D–G) Mouse livers were perfused in situ with medium with (EtOH) or without (Ctrl) 100 mM ethanol for 2 h. (D) ALT levels in the medium. (E) Immunoblot assays for CYP2E1. Full-length blots are presented in Supplementary Fig. S2. (F) qRT-PCR assays for Cyp2e1, Adh1, and Adh5. (G) Representative CYP2E1 immunohistochemical staining. Scale bars = 50 μm. Gene expression was normalized relative to that of Actb. Data are shown as mean ± sem. *P < 0.05, **P < 0.01, ***P < 0.001 versus the corresponding control. (A) Schematic figure of the experiments. 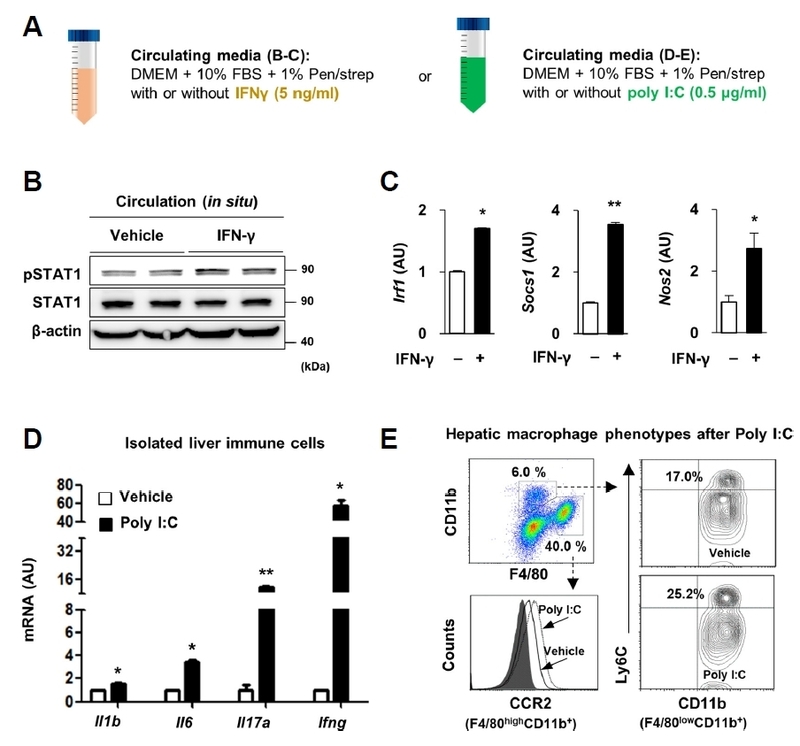 (B–C) In situ liver perfusion with medium with or without IFN-γ (5 ng/ml) for 1 h. (B) Immunoblot assays for pSTAT1 and STAT1. Full-length blots are presented in Supplementary Fig. S3. (C) Expression of Irf1, Socs1, and Nos2 mRNAs in whole liver tissues. 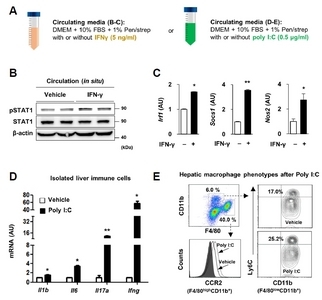 (D–E) In situ liver perfusion with medium with or without poly I:C (0.5 μg/ml) for 1 h. (D) Expression of Il1b, Il6, Il17a, and Ifng mRNAs by isolated hepatic immune cells. (E) Flow cytometric analyses of isolated hepatic immune cells. Gene expression was normalized relative to that of Actb. Data are shown as mean ± sem. *P < 0.05, **P < 0.01 versus the corresponding control. 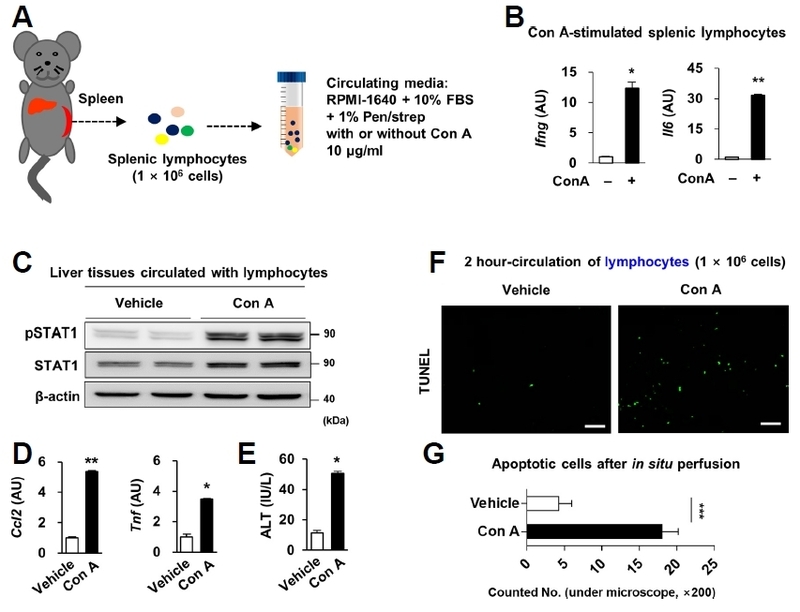 (A–F) Splenic lymphocytes were isolated by grinding and placed in circulating medium with or without 10 μg/ml Con A, followed by in situ liver perfusion for 1 h. (A) Schematic figure of the experiment. (B) Expression of Ifng and Il6 mRNAs by isolated splenic lymphocytes. (C) Immunoblot assays for pSTAT1 and STAT1 in whole liver tissues after perfusion. Full-length blots are presented in Supplementary Fig. S4. (D) Expression of Ccl2 and Tnf mRNAs by whole liver tissues after perfusion. (E) ALT levels in circulating medium. (F) Representative TUNEL staining after perfusion. Scale bars = 50 μm. (G) Numbers of apoptotic cells assessed by TUNEL staining. Gene expression was normalized relative to that of Actb. Data are shown as mean ± sem. *P < 0.05, **P < 0.01, ***P < 0.001 versus the corresponding control. Livers were perfused in situ with medium at flow rates of 1 ml/min (low) and 3 ml/min (high). (A–B) Formula for calculating shear stress and its dependence on vessel diameter and vessel branch number. (C) Expression of Ccl2, Cxcl1, and Nos3 mRNAs by isolated LSECs. 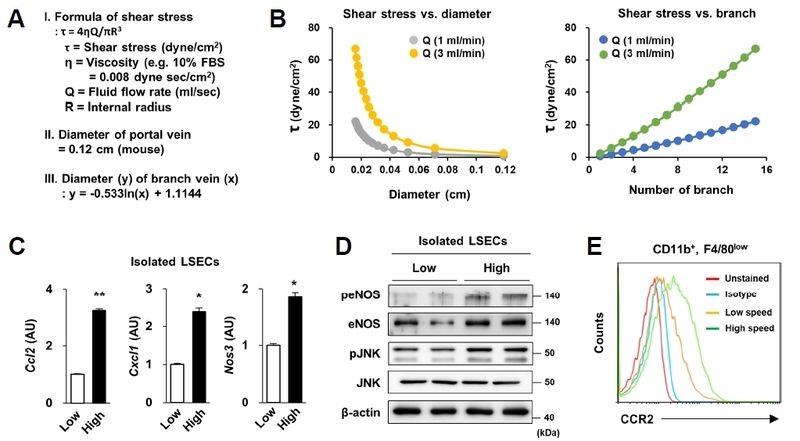 (D) Immunoblot analysis of peNOS, eNOS, pJNK and JNK by isolated LSECs. Full-length blots are presented in Supplementary Fig. S5. (E) FACS assessment of CCR2 expression in isolated CD11b+F4/80low infiltrated monocytes. Data are presented as mean ± sem. *P <0.05, **P <0.01 versus the corresponding control.